Lectins have potential for application in many fields because of their ability to selectively bind glycoconjugates. Jackfruit seeds are a source of various lectins, with several isoforms and isoelectric points. Therefore, ion exchange can be a viable alternative for lectin separation. In this work we developed a single-step purification protocol for lectins from jackfruit seed extract in ion exchange cryogels. Supermacroporous cryogels were functionalized with cationic and anionic exchangers. The matrices produced showed high swelling capacity (12.4 and 14.7 kg kg-1), expansion degree (12.70 to 18.0 L kg-1), and total porosity around 90%. 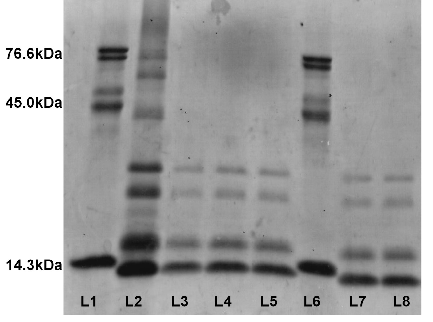 The performance of the ion exchanger cryogels in lectin purification were evaluated. A single elution peak was obtained in all assays. The purification factor (PF) was determined based on the agglutination of human blood ABO types, with a PF of 3.57 in the best condition, using the cryogel functionalized with 2-(Dimethylamino)ethyl methacrylate (DMAEMA) and blood type B agglutination, suggesting the jacalin purification. SDS-PAGE electrophoresis confirmed that the eluted samples showed two strong bands around 13.5 kDa and 16 kDa. The results demonstrate that ion-exchange monolithic cryogels showed potential use for the purification of lectins from jackfruit seeds in a rapid and single-step protocol.